Goworking is the practice of conducting business fluidly, at any time in any location; a concept every freelance worker is familiar with. If you often work from home you’re no stranger to distractions whether that be picking your kids up from school, walking the dog, or watching the final episode of your favorite Netflix series; distractions at home can be relentless. The work/life separation of a freelance lifestyle can become quite blurry when your bedroom doubles as your office, your kitchen as a part-time conference room and the alley next to your building as a private phone booth. The truth is sometimes your home, as comfortable as it may be, is hazardous to a productive workday, which is why Prosper Gowork offers a space to do just that, Go Work. Prosper Gowork is a fresh take on collaborative work spaces that provides its clients with a comfortable environment conducive to success! Prosper Gowork is a 24/7 facility with everything you need and nothing you don’t. It offers an array of amenities such as: conference rooms, private phone booths, exclusive meeting pods, quality high speed Wi-Fi, bike storage and of course FREE coffee! Prosper Gowork is a distraction free environment with a fresh minimalist look offering two convenient Brooklyn locations in Bed-Stuy and Crown Heights, all for $99/month. Prosper Gowork is built for mobile professionals that do not operate on the typical 9-5 schedule. They understand the unique needs of remote workers in today’s gig economy and is dedicated to providing its members with a convenient space to be productive. Prosper Gowork is expanding to more convenient locations in the spring of 2019 to meet the growing demand of a hassle free work spaces for freelancers and business professionals from various professions. 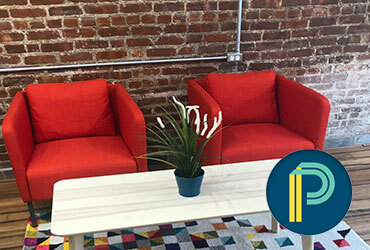 Freelancers all across New York City need a space to get work done and Prosper is just that, a relaxed domain without the intrusions of the outside world that diminish your productivity. Special thanks to Sean Ritz for the writeup!